I have a lot of data. The fact I've used computers since before I could talk and have never deleted anything (and I mean anything, I have a picture of a horse I drew in Windows 3.0 Paintbrush dated 1990, which meant I was 4!) means today I have gigs upon gigs of stuff. So yesterday to ease the latest squeeze on my three external hard disks (an Iomega 160GB, a Western Digital 320GB and a Western Digital 160GB) I purchased a Seagate 400GB one-touch external hard disk. 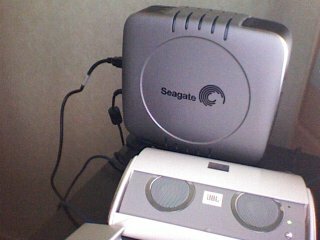 I got the Seagate because it was the most affordable external hard disk that still has FireWire 400, a port which you are no doubt aware is becoming increasingly rare these days. So I plugged in my new Seagate external hard disk into the FireWire 400 port on my MacBook Pro and proceeded to the Mac OS X Disk Utility as per the instructions in the manual (IRTFM), only to discover that not only was there no new device detected at all, but I smelt the telltale smell of electrical smoke. I panicked and pulled out the FireWire plug. I've gone to the Apple support website and have read the FireWire troubleshooting article, reset the "Pro System Management Controller" (SMC), reset the PRAM and NVWAM without any success leading me to one conclusion: what I smelt was the smoke coming from my toasted FireWire controller or port. Oh but it gets better! Because I got my MacBook Pro in March 2006, the warranty has expired. The FireWire port in the MacBook Pro is part of the motherboard, so I will have to have the whole board replaced which could cost an absolute fortune. I'm not a lawyer and I'm not studying law at university, but I know that it's not my fault that my FireWire port is now dead. I used the Seagate external hard disk exactly as the instructions said, no funky business, and now I have a dead FireWire port and possibly a dead external hard disk. I know it's my right to demand a new hard disk from Seagate, but what about my damaged motherboard in my MacBook Pro? If I was the kind of person who didn't use FireWire that much I could probably just ignore that port and get on fine without it, but I do video editing, I have a FireWire-only iSight and another external FireWire-only hard disk which I use because it puts less strain on the CPU than USB 2.0 does under very heavy loads… this port is critical to my studies and to my work, and it's completely dead. 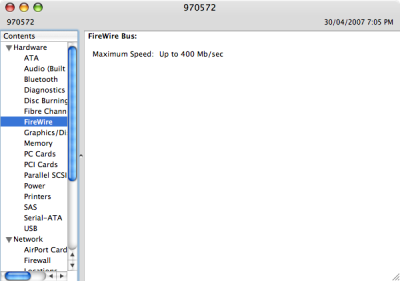 And what about my other external FireWire drive? I have no way of getting the data off that until my other computers are unpacked from our move which won't be for another 5 weeks! Older post → Adelaide in… Austria?